Dylan Scally interviews Fitness Instructor Garreth Lloyd and TCPID student Dairine O’Rourke about their fitness journey together over the past two years. Garreth and Dairine have worked together since 2016, when Dairine joined Trinity as a student on the Certificate in Arts, Science and Inclusive Applied Practice, a 2-year FETAC level 5 course for people with intellectual disabilities based within the School of Education. They have worked tailoring a fitness journey to one another’s needs, goals and experience. Their work together has provided positive benefits to one another, individually reported as the development of self-esteem, improvements in physical literacy and fitness, independence and confidence. Dairine and Garreth have come together for a final session to reflect on their experiences in the hope of providing some insight and confidence to those who will be working together for the first time, so follow us as we take some snapshots of their journey together. Like most new students, Dairine had never been in the Sports Centre before coming to Trinity, and had never used free-weights or machine weights. These represent adaptable methods of exercise but are limited by lack of familiarity and confidence, limits that a fitness instructor can help to resolve. 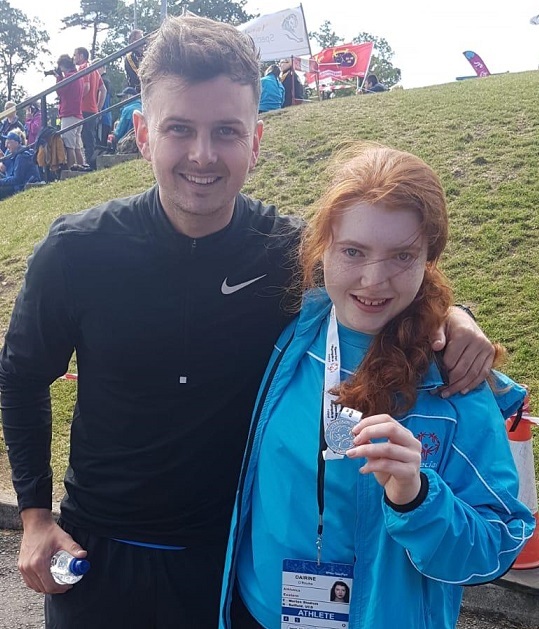 Already a member of the Celbridge Condors and Leixlip Special Olympic Clubs, and a regular walker of her trusty companion Lincoln, Dairine was no stranger to physical activity. However, she described herself as “nervous” at the prospect of working with a fitness instructor for the first time, not knowing the instructor and how hard she might be pushed. These nerves were matched by those of Garreth, who had never worked with an individual with an intellectual disability before. Both approached the journey with a nervous excitement. After the initial assessment screening and with the empowering push of close family and reassurance from colleagues, Dairine and Garreth together set out a fitness program to follow. When asked about the design of the program, Garreth tells us how repetition of a small number of exercises helped to ensure that Dairine would develop confidence and competence, so with a full body workout designed, the journey had taken its first step. So how did that first session go? Not dissimilar to the usual apprehensions of a fitness training session, Dairine’s nerves about her ability and fear of being pushed too hard were met with Garreth’s cautious approach and hesitancy to overdo it, resulting in both feeling relieved, more confident and excited for the next session. Fast forward a couple of months, with both Dairine and Garreth maintaining consistent communication they were able to monitor progress and continue the development of the program, shifting training in a direction that was repeatedly demonstrating the higher level of capability achievable by both. After several months of weekly training, program design by Garreth was now quite different. Focus shifted from repetition of a small number of exercises, to a greater variety of exercises, as well as the introduction of outdoor training sessions. Confidence and trust in each other’s capabilities was matched by the growing confidence and trust in their own abilities. By the end of year one there were more competitive goals now in mind, Dairine was selected to represent the Eastern Region team in the upcoming Special Olympics National Games in athletics, specifically the 400m and 800m walking race events. Often a specific goal can hide many concurrent victories – for Dairine being able to walk a little bit faster was her initial goal. Fast forward to the end of academic year 2, with early starts, research projects, work placements, two consistent years of training behind her and upcoming competitive events, Dairine managed to balance it all. When asked whether exercise had an impact on her life in this time, Dairine’s answer was a whole-hearted yes, from “greater self-belief”, “being able to stand on the bus while using a phone”, “making everyday life easier” and “feeling more relaxed”, it was clear there were more victories than planned. As instructors, we are expected to instil the change, but drawing upon your experiences and learning from those you work with is a privilege to which we are regularly exposed, and can instil just as much change in ourselves. When asked whether working with Dairine has had an impact on his work, Garreth’s response was an equally whole-hearted yes, and a transition from a nervous “Am I able for this” at the very beginning of their journey, to a confident “I can do a great job” at the end. Garreth also describes a change in approach to the rest of his work with other clients and users of the Sports Centre, by applying “new ideas and methods of improving fitness”, and “thinking outside the box” as well as “taking a step back”, it is clear that both Dairine and Garreth have benefited hugely from working with one another. With Dairine’s University life now approaching its end and their fitness journey together likewise, we asked each to offer a piece of advice to the Frontline readers. Dairine was quick to promote the message, “Keep fit, exercise and use the Sports Centres”, while Garreth had two: for individuals with an ID, “Not to be wary, and to come in and use the Sports Centres and work with the Instructors”; and also for Instructors, “Don’t panic, be confident and enjoy the work, be happy to be a part of changing someone’s life”. Organically a bond may form between trainer and trainee, and with Garreth amongst her supporters, the words of Dairine about her experience competing at the Special Olympics National Games encapsulates this adoringly. Describing the half way point of the 400m event, “When I heard Garreth’s voice it helped me to walk faster,” Dairine said on completing the event with a 20-second improvement on her previous best time. This encouragement from Garreth was mirrored by his proudness of seeing all of Dairine’s hard work culminate this way, although proudness quickly transcended into gratitude for being able to work with and learn from Dairine in achieving everything that she has. Together these two have made a lasting impression on one another; both are sure that they will continue to encourage each other to keep progressing their fitness journeys. Both leave this story with an infectious air of confidence, capability and encouragement, answering the question that many pose to themselves of “Am I able for this?” with a definitive yes. Dairine O’Rourke is a soon-to-be graduate of the Certificate in Arts, Science and Inclusive Applied Practice, a 2-year FETAC level 5 course for people with intellectual disabilities based within the School of Education at Trinity College. Garreth Lloyd is a fitness professional at Trinity Sport with over 6 years of experience in exercise prescription. Recently Garreth has been responsible for the delivery of practical exercise and sport sessions to the Students of the TCPID. Dylan Scally is the Sports Participation Officer at Trinity Sport. Dylan is involved with sport program delivery to the students of the TCPID and external centres, and also sport participation for the internal University community and external communities. Caroline Duggan is the Senior Sport Development Officer at Trinity Sport. Caroline has been directly involved in the integration, development and delivery of Health and Sport modules to students of the TCPID as well as the co-ordination of projects including the P-PALs. Mary-Ann O’Donovan is the Assistant Professor in Intellectual Disability and Inclusion in the School of Education. Responsible for the development of course framework and content within the TCPID, Mary-Ann is also a key driver of research in the field of Intellectual Disability, current projects including the P-PALs.